Based off of a novel written by Koushun Takami in 1996 (and published in ’99), both the film and it’s source material, Battle Royale, were met with controversy and critical acclaim due to its portrayal of teenagers massacring one another (in quite gruesome and gratuitous ways). Despite this, the praise overwhelmed the criticism, and in 2000 the book was adapted and directed by Kinji Fukasaku, who was inspired to do so due to his own personal experiences. In an alternate early 21st century Japan, in response to student rebellion and disobedience, the Japanese government has begun taking classes of students, dropping them off on an abandoned island, and forcing them to combat one another to the death until a single student remains. The class that the film revolves around includes a variety of different characters who, although they may not be distinctly familiar, unique, or even distinguishable from each other, act as substitutes for the audience to project themselves onto. Those that do stand out are sure to leave an impression. The protagonist is fifteen-year-old Shuya Nanahara, who finds himself struggling due to the recent suicide of his father, leaving him orphaned. After his best friend is killed, Shuya swears to protect his love interest, Noriko Nakagawa, though he initially finds himself too weak mentally and physically to do so. The characters here are not heavily developed – not even the main leads. Flashbacks are utilized to establish motivations and pathos, and are aided by the score. Exciting, fast-paced pieces keep the action tense and the suspense thrilling, and slow, operatic, and classical pieces are used often in the wake of a death or action scene (whether tragic or exhilarating) to create a jarring contrast that both unsettles and unwinds. The lack of complex characterization here is permissible do to the fact that the aim of the film is not to provide a classic character arc, but to represent what normal people either devolve or evolve into to survive or protect their loved ones. As it is, the characters work well. Even without knowing much of them past the surface, the movie does manage to make you sympathize. As aforementioned, the score here works well, complementing the scenes where it is featured, notably the action ones. The combat here is fierce, relentless, and the bloodshed not for the faint of heart. The camera captures every essential moment, shaking about appropriately to contribute to the tense situations. 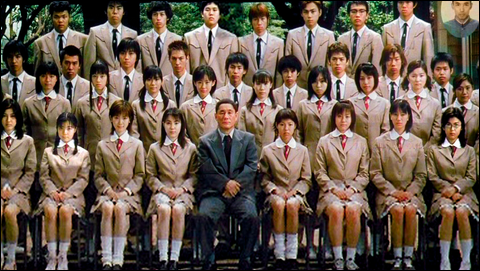 Battle Royale is a movie that works well even if the viewer is ignorant to whatever message it is trying to teach, which is always a positive. Subtle enough to be missed, but strong enough to leave an impact and leave you satisfied regardless. The brutality never feels excessive because seeing these people in these situations, and their bonds with one another, the viewer cannot help but wonder, and possibly realize, who they would be in the scenario, and if they would be the last man standing.